Salesforce is a global leader in cloud services. It offers a range of services over the cloud to help businesses small and large with their operations. These services include ERP, data storage and retrieval and so on. The Salesforce Install Users Email List provides a database of email information of users of salesforce’s products. Furthermore, it has segmentations according to their usage metrics and location. Additionally, since the Salesforce Customers List users are companies, Infos B4B also includes the details of executives. This list allows marketers to understand the market for similar products and know company preferences. With this knowledge, vendors of relevant products can promote appropriate products to ideal candidates in light of current trends. So, the Salesforce Customers List enables marketers to take a deductive approach to product promotion. This method demonstrable yields greater customers and earns more ROI. 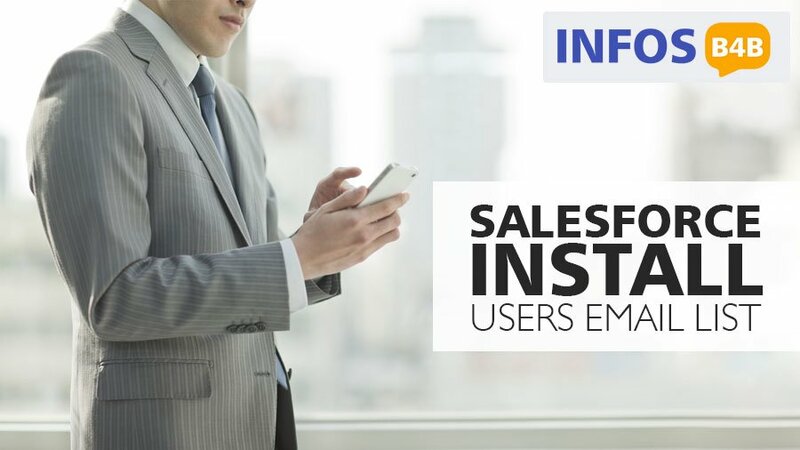 Salesforce Install Users Email List is the most effective database provided by Infos B4B which imparts accurate mailing addresses of the reputed leads from Technology Industry. Advertise your brand globally via various channels of communication. Procure the most beneficial and captivating features from the database and intensify the rate of traffic density and click-through rates. Get the most authentic and legit database from us. How will my Salesforce Install Users Email List be delivered? We deliver our most of the order list within a minute to the email address that you provide. However, it also depends upon the size of the database. Additionally, we re-verify our database before putting it into your hand. So, the time frame may vary and accordingly it proceeds. To know the best ways to improve your marketing results by utilizing our Salesforce Install Users Email List, call us at +65-3158-3966. You can also mail your queries at info@infosb4b.com.